Corpus Christi saw growth this year as house prices rose 7.3% with a median price of $198K compared to last February. 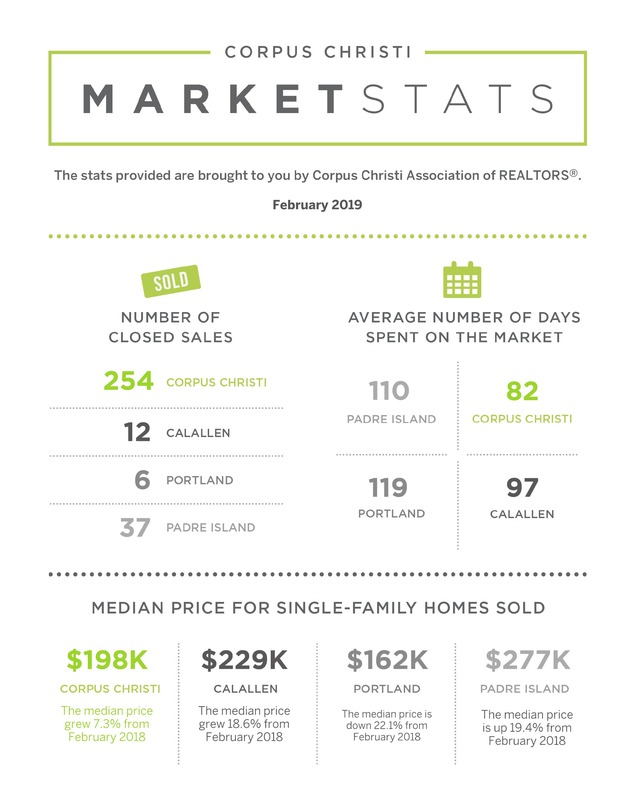 With active listings down 5.8% and homes and the market for an average 82 days (12 days less than February 2018), we could be seeing possible signs of an active spring and summer market in Corpus Christi. The Calallen market continues to show signs of growth, with active listings up by 22.2% and closed sales up by 33.3%. These numbers could put Calallen on track for an active summer season if the number of closed sales increases. Portland saw little activity this February. With a total of only 6 closed sales (down 76.9% since last February) and an inventory of over 6 months, the numbers are pointing to a possible slowdown in that market. A possible attempt to jumpstart the market could be why we saw median home price down 22.1% to $162K in a possible effort to remain competitive. Padre Island continues to see increased median prices at $277K which is up 19.4% from last February. Houses even at this price point are going fast with homes selling an average of 10 days faster than February 2018. With closed sales up and active listings down, it would not be surprising to see increasing prices as the spring market continues.